Few things excite me more than the notion of designing for buildings by my favorite architects. So I’m pretty euphoric about having landed a retail display and merchandise graphics gig for Renzo Piano‘s new California Academy of Sciences building right here in San Francisco’s Golden Gate Park. 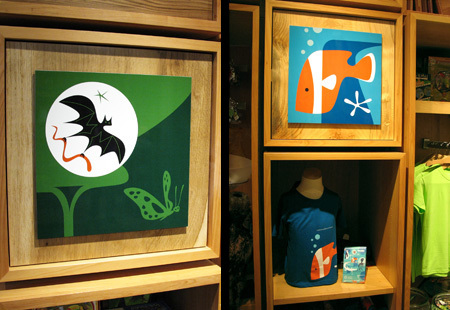 Rainforest and Aquarium display panels, t-shirts, notebooks in the main store. Creative director Rhonda Rubinstein and I collaborated closely since April to create twelve theme illustrations representing the museum’s featured attractions and areas of research. Elements of the images were used to create graphic wall panels throughout the Academy’s three retail stores, as well as motifs that appear on a multitude of products from t-shirts to caps to notebooks to chocolate bars (an essential pick-me-up after a day of exploring a museum this size). Integrated into many of these motifs is the Academy’s new logo designed by Pentagram San Francisco. 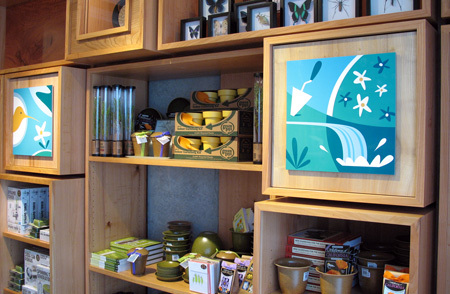 A pair of display panels in the main store's Sustainability and Gardening retail area. The new Academy is not to be missed. The structure features an aquarium, planetarium, natural history museum, and 4-story rainforest under one roof. A living roof that is, carpeted with 2.5 acres of plant species native to the Bay Area. The LEED-certified complex is reportedly the greenest museum in the world, and the design — in typical Piano fashion — is undeniably smart and gorgeous throughout. 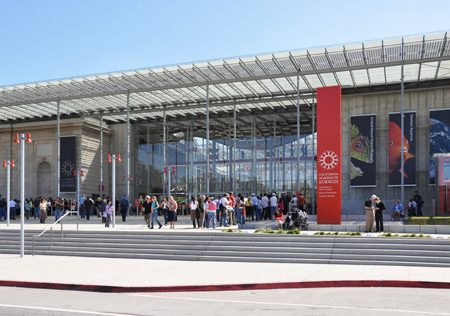 Contributed attractions include main floor exhibits created by locals Adam Brodsley and Eric Heiman at Volume in collaboration with L.A.-based Cinnabar, Maya Lin‘s expansive wire sculpture hanging from the west facade, and the swamp’s crowd-pleasing albino alligator courtesy of Mother Nature herself. Nicolai Ouroussoff’s Times review sums up the extraordinary visitor experience here and photographer Tim Griffith’s images showcase the building in all its architectural glory here. I’ve never been prouder to be part of a team-effort endeavor. Elvis Costello rocks out on the Academy's west lawn. A string of previews and parties throughout September culminated with the Academy’s posh Big Bang Opening Gala on the 25th with live music provided by no less a legend than Elvis Costello. Major flashbacks to my art school days provided evidence that Elvis is still kickin’ it. Check back for more photos of display graphics and products as they arrive. Better yet, pick them up in person at the museum. Don’t forget the chocolate bars!